Imperios Milenarios (Millenarian Empires) is a game where each player leads an ancient civilization of the World, expanding its territories, improving its sciences and boosting its industries throughout the Ages. The game will last until a number of civilizations reach the Bronze or Iron Ages, when points will be awarded for the territories and cities occupied, technologies discovered, trade goods obtained, Wonders built and treasure. One distinctive element of the game is the use of a deck/pool-building mechanic mixed with role selection (similar to Eminent Domain) by which players draw a generic action of their choice to boost their hand every turn. This is done with little chips instead of cards, where chips in four different colors are each associated with a couple of possible actions. For instance, players can use blue chips in their hand (fleets/caravans) to expand to an adjacent maritime region, or, to trade goods and discoveries with other players. As the game progresses and civilizations advance, the map will become gradually more and more crowded, players in turn will increase their hand sizes, and their chips will become more and more efficient by means of technological advancements, thus gradually increasing in complexity of negotiations and military tension. So the core of the interaction between players comes not much from direct conflict, but from the constant negotiation everyone is subject to, for the purpose of establishing accessible trading cities and beneficial exchanges, all the while procuring secured “buffer zones” between their Capitals. A “hard sci-fi” game about space colonization where players will be settling planets and moons of the Solar System in a not-so-distant future. Those will be of different types, ranging from orbital to subterranean ones. The different types of colonies will provide different resources, such as materials for self-replication (MAT), energy (NRG) or organic-life support (H2O), and each will adjust better or worst to the parameters of Gravity (G°), Pressure (P°), Radiation (R°) and Temperature (T°) depicted for each location. As the game progresses, players will be building a network of colonies that will provide these resources to the joint colonization effort (for a price). Players will also be able to contribute in major shared projects, such as the terraforming of Mars. When a certain number of colonies are established the game will end, and the player having the most influence in the now-populated Solar System (acquired by leading the many logistical and technical endeavors) will emerge as the leader of the new Solar Federation. The game uses a time/cost turn order track similar to "In the Year of the Dragon" or "Thebes", where players performing a more demanding action will be pushed back farther in the turn order track, while the player in-turn will always be the one ahead in the track. Another distinctive element of the game is the shared nature of the resources, as every player can use technologies, colonies and their resources output, belonging to other players, to boost their own colonization plan. This is done for a price, as “lending” these assets advances its controller in the turn track. The educational aspect of the game comes from the realistic depiction of the different environments in space, the theoretical technological and logistical steps required to settle them, and a number of “flavor data” notes scattered throughout the game board. Días de Radio is a storytelling cooperative card game in real time for 2 to 4 players. The players will choose one from a series of 12 subgenres, and tell a story using phrases in the cards. The storyteller will set aside her hand during her narration, only using cards given by the other players until the time runs up. Then the storyteller turns in clockwise order and the next player begins his turn storytelling. Each turn brings the game closer to conclusion. When the endgame is triggered, the current storyteller will have the responsibility of closing the story. Each card will give points according to the difficulty of the ideas represented, and the points added will be compared to a table, thus indicating the level of success, in funny microfiction forms. The game is in Spanish, full languague dependence, and it has an icon system for the color blind. Each game takes 20 to 30 minutes. LED is a challenging strategic game where every game is unique. Players must place their tiles closing different colored led circuits starting from a base tile. For every closed circuit both the player and the color collect points. However, until the end of the game, each player color remains secret. Only through a clever combination of strategy and bluff can a player claim victory in the end. los jugadores deben ubicar sus baldosas sobre la mesa cerrando circuitos de leds de diferentes colores partiendo de una baldosa base. Por cada circuito cerrado acumula puntos el jugador y el color, este último es secreto. Hasta que el juego termina no se conoce el ganador! In Burger Chef there´s a lot of different orders, but just one burger! Everybody must contribute adding or taking away ingredients to make the best burger, but who will make the happiest customer? In every turn you roll a 6 sided die with colours in its faces. Depending on the colour you rolled you must add or take away an ingredient of that colour from the burger that all the players are making together. If you choose to take away an ingredient you must also take away all the ingredients above it. Finally at any time you may spend one of your limited french fries to make someone (you or any other player) reroll the die. But at the end of the game the player with most fries wins points. When the ending condition is meet, the burger is over and everyone compares the resulting burger with their orders and count points for the objectives they accomplished. The player with more points is the winner. 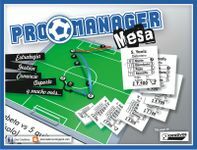 Pro Manager Mesa (soccer) is a game based on the management, purchase and sale of players, strategy and sport. As Manager of your club you must manage the best way possible, making the best buys for your team, select the best training and take the greatest care with the use of money from the club. All this don't takes you away from the most exciting part of the sport, the game. As positions your players play when the meetings is essential to leave the field victorious. Buy the best dribbler to stop letting all the opposing defense, the best keeper to pick all the balls from all angles. Everything depends on you. 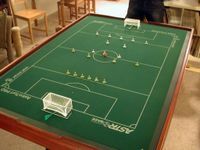 Pro Manager Mensa es un juego de fútbol basado en la gestión, compra y venta de jugadores, estrategia y deporte. Como Manager de tu club debés administrarlo de la mejor forma posible, realizar las mejores compras para tu equipo, seleccionar los mejores entrenamientos y tener el mayor cuidado con el uso del dinero del club. Todo esto no te aleja de la parte mas emocionante de este deporte; el juego. Cómo posiciones a tus jugadores a la hora de disputar los encuentros es fundamental para salir victorioso de la cancha. Partidos dinámicos con árbitros no siempre parciales, tribunas alborotadas que pueden llegar a provocarte un dolor de cabeza, una lluvia inesperada que embarra el campo de juego o un sol encandilante que enceguezca a tu arquero son factores que te van a sorprender partido a partido. Compra al mejor gambeteador para dejar parada a toda la defensa rival, al mejor arquero para descolgar todas las pelotas de todos los ángulos o al pulpo defensor que atemorice a cualquier delantero. Todo depende de vos. "EMPRESARIOS - corruptus in extremis" is a game of strategy and political negotiation in which each player assumes the profession/role of one of the wealthiest characters of the city. The objetive is the unique and absolute monetary enrichment. Votes, fraud, alliances, revenge, and management of funds make this game one of the most hilarius games ever. Players will have Millions of Pesos (M$) to negociate between the players and buy new buildings. The Players whom ends with more money in the personal bank account will win. The fate of many is in hands of a few. EMPRESARIOS can be played by a group of three to eight people. The ideal number is between four and six. A game of "Empresarios - corruptus in extremis" is played in turns, which for the purposes of the game represents 1 year of government. During each turn, players follow a sequence of the game that consists of eight specific phases (see Reference Dashboard; it is considered to the democratic election of the mayor as the principle of the turn). Each phase is resolved by all the players always starting with the Mayor, followed by the player to his left (clockwise), up to complete the turn. Beginning of turn (or year of government). End of turn (or year of government). This sequence is repeated until the end of the game. 1) Each player must choose one of the twelve cards of profession/role. Each player must read the information and abilities of their respective profession card. 2) Each player receive the initial money and the initial cards that indicates the profession/role card. This will become part of your "pocket money". 3) At the end of each year (game time), each player may have up to six cards in the hand. In case of having more than six must immediately play or discard to reduce his hand to a maximum of six. 4) The game begins with the Democratic Election of the Mayor. All players votes their candidates (with Votes cards) and the candidate who receives the most votes is elected Mayor. The Mayor may decide how to use the funds received by the Taxes of other players Buildings. 5) The game have two different types of cards: 81 "Buildings" and 99 "Situations". The combination and the diversity of each card makes the real fun and estrategic of "Empresarios". 6) The only safe money is the money that has been deposited in a Personal Bank Account, and the only way to get to the bank is making a "Bank Deposit" with some special Situation cards. 6) The key of the game is the negotiation between the players to gain votes and cards. The Players whom ends with more money in the personal bank account will win. The goal is to amass the greatest wealth in your Personal Bank Account. Fulbito con chapitas, fútbol chapas, futbolín... seguro que más de uno lo habrá jugado sin ponerle ese nombre. Si les gusta los juegos de gemas o caramelos les recomiendo esta version de 1 a 4 jugadores que he hecho para Bisonte. Es competitiva, tactica y tiene su cuota de take that. Tambien se juega en modo solitario. No es facil ser un Señor del Mal. Las horas a las que hay que levantarse apestan... Encontrar sirvientes eficientes es un dolor de medula... Y conservar tu "bien merecido" tesoro de las garras de los heroes termina siendo un trabajo full-time. Pero es tu OFICIO y la fama adquirida en el circulo Interno de la Maldad lo es todo para ti... asi que porque no mostrar a los demas Señores como se hace un buen trabajo demoniaco! En los Señores del Mal los jugadores toman el rol de Señores Oscuros que estan repeliendo el ataque de audaces heroes aprisionandolos cuando son derrotados para asi ganar la tan preciada fama. 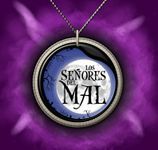 Este juego relata la historia de un evento que sucede en buenos aires en un futuro no distante que termina convirtiendo a toda la poblacion en un equivalente de los muertos vivientes de las peliculas. Es en si un Survival de Zombies cooperativo que dura entre 45 minutos y una hora. Tiene 3 modos de juego: Facil, Normal y Dificil. Mi idea no es solo generar una mecanica cooperativa que sea entretenida y sin huecos, sino que para cuando termines de jugarlo el corazon te haga tuc tuc tuc con la sensacion de una constante situacion de peligro y una derrota inminente. El modo Facil es mas que nada introductorio y lo ganas 4 de 5 veces. El modo Normal tiende a ser ganado 2 de cada 5 veces. El modo Dificil tiende a ser ganado 1 de cada 10 veces. Y siempre que lo ganas... lo ganas al borde de perderlo. Eso es importantisimo. Es un juego con una gran cuota de azar y estrategia, pero principalmente de cooperacion en las que a veces un error de decision termina siendo lo que condena a los heroes.